ATLANTA – Citing his “invaluable contributions to peace and justice around the world,” Morehouse College has bestowed its prestigious Gandhi, King, Ikeda Award for Peace on Dr. Peter Ackerman, founding chair of the International Center on Nonviolent Conflict (ICNC) and a leading voice on civil resistance research and education worldwide. The award is named for Mahatma Gandhi, Martin Luther King, Jr., and Daisaku Ikeda, all renowned practitioners and leaders of nonviolent resistance against oppressive laws and customs that deprived masses of their rights, freedom and justice. King was an alumnus of Morehouse, one of the country’s oldest historically black colleges. Ackerman accepted the award in an April 5 ceremony at the Martin Luther King International Chapel on the historic college’s campus in Atlanta, where he told his audience that civil resistance remains a productive mechanism for change. “Historically citizens living in despotic regimes are believed to have had two choices: Either abject submission or violent insurrection,” said Ackerman. “Now, largely as a result of the examples provided by Gandhi and King, there is a third alternative that in my humble opinion is profoundly changing the world…. Before co-founding ICNC, Ackerman helped write A Force More Powerful: A Century of Nonviolent Conflict, a leading-edge analysis of the circumstances, actors, strategies, tactics and consequences of some of the 20th Century’s most significant nonviolent struggles. The book is globally hailed as a guidepost for nonviolent civil resistance methodologies and structures. Ackerman was also the executive producer of a documentary based on a portion of the book related to the downfall of Serbian dictator Slobodan Milosevic in 2000. That film, “Bringing down a Dictator,” won a coveted Peabody Award, an Emmy nomination and more than 20 film festival awards. It has aired in more than 100 countries. Taking cue from the popularity of the book and movie, Ackerman co-founded ICNC in 2002 to study the components of nonviolent conflicts and share that scholarship with activists, movement leaders, policy makers and other non-governmental organizations. The organization gathers and shares the fine points of resistance struggles from a wide range of campaigns and movements on every continent. “Recently a study funded by ICNC looked at 323 insurrections between 1900 and 2006,” Ackerman said. “They were divided into two categories: insurrections dominated by violent tactics and insurrections dominated by nonviolent tactics. 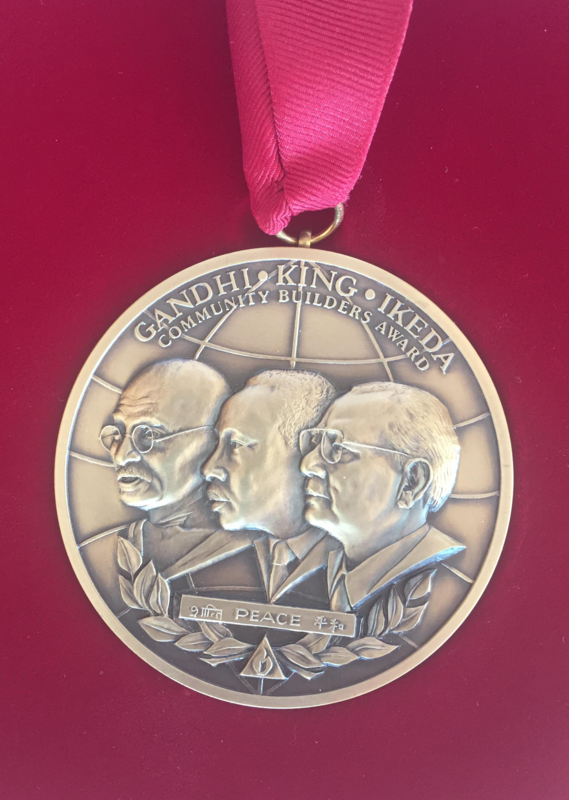 Morehouse established the Gandhi, King, Ikeda Award in 2001 to honor “those who demonstrate extraordinary global leadership toward reconciling differences.” Previous recipients include South African leaders Nelson Mandela and Desmond Tutu, former Soviet President Mikhail Gorbachev, and civil rights icon Rosa Parks. The school unveiled an oil portrait of Ackerman at the ceremony. The painting will be displayed in the King Chapel’s International Hall of Honor alongside portraits of past honorees.